Overwatch's latest animated short "Shooting Star" delivers D.Va and her mech in action – AiPT! Omnic forces are attacking and D.Va’s the only thing standing in their way. The long wait is over, my friends: D.Va’s animated short is finally here. Blizzard released the latest Overwatch animated short this morning on Twitter after announcing it earlier this week. Feast your eyes on “Shooting Star”. There’s little argument that D.Va is the most beloved of the 28 Overwatch heroes. Ever since Blizzard first began releasing animated shorts, fans have been begging for the South Korean mech pilot to get her own. The animated shorts are part of Blizzard’s multi-pronged approach to telling the story of Overwatch. “Shooting Star” is no different. We get a look at a side of D.Va that we’ve never seen before and find out details of her life behind the scenes. D.Va, former esports champion, is the leader of a South Korean special defense force known as the MEKA squad — a squad of five mech pilots who defend the country from Omnic attacks. The attacks have been increasing in frequency, danger and difficulty. With the latest seeing almost the entire squad’s mechs destroyed. The constant combat and the pressure of having to defend the entire country has taken a toll on D.Va. The emotional strain of almost dying on a regular basis and being expected to have a smile on her face at all times is starting to show. Thankfully, D.Va isn’t all by herself. She has a friend by her side, whose name I’m still not sure of (even after listening to her utter it 4-5 times). Her friend sees the pressure she’s under and urges her to take a much needed break. This young man is not only D.Va’s friend, but also the pilot of a hover bike (HINT HINT). There’s no way this guy isn’t going to becoming an instant noodle loving, hover bike riding, Overwatch hero in the near future. You heard it here first! Before D.Va’s and her friend can finish their argument about when she should take a vacation, another Omnic attack occurs. We get to see D.Va and all of her classic moves in action — defense matrix, light gun, gatling cannons and of course, self-destruct. D.Va makes it out alive, but has a broken leg and a busted arm. But that doesn’t keep the smile off her face. 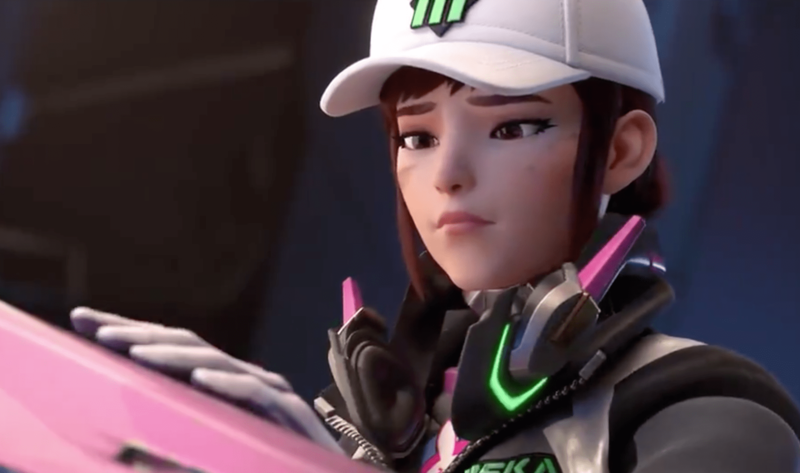 The short was announced to fans at-large on Overwatch’s Twitter account, but it debuted at a fan event in South Korea. Along with the short, Blizzard has debuted a new control map set in Busan, South Korea.